The Vertu Constellation will cost you £4,200, but can it possibly be worth it? What's that, sir? Looking for something just a little different from your average smartphone? Tired of the regular, off-the-shelf, handsets littering the high street? Well, not to worry, sir - I think we have just the thing! Reviewing the Vertu Constellation is, shall we say, a little different from the rest of the handsets on T3.com. Setting you back a cool £4,200 and with various real-world fringe benefits on offer, this is a long way from the mainstream iPhone 5s, HTC One or Sony Xperia Z1. This is Vertu's second Android handset after the Vertu Ti. And, while the internal specs might not be much to write home about, the construction of this (British handmade) phone is in a class of its own. We're talking a sapphire screen, authentic stitched leather backing and a grade 5 titanium chassis. Which is the least you'd expect, given the price. Of course, there's more to the phone than that, so read on to find out what the Constellation has to offer. The Constellation has a 4.3-inch, 1,280 x 720 display that's coated with a 5.1-inch sheet of pure sapphire crystal that covers the entire front of the phone. There are no physical buttons on the front of the device as it uses Android's soft-touch navigation keys. While the resolution isn't the fully fledged 1080p of the HTC One, it'll still run a 720p HD video and look crisp and detailed while doing it. The sapphire coating means this phone is just about scratchproof - unless you happen to have a couple of rough-cut diamonds rattling around in your pocket. In fact, Apple has recently indicated plans to open a new factory in Arizona to concentrate on producing sapphire iPhone screens. The rest of the Constellation is similarly premium. The back of the phone is covered in hand-stitched calf leather imported from the Alps. According to the head of design at Vertu, the leather itself is tested with sweat, alcohol, petrol, ketchup and put through various humidity cycles to make sure it's up to the task. In practice, it gives you excellent grip when making calls or tapping out a text message. Grade 5-titanium casing makes up the chassis and is twice the strength of regular stainless steel, but only half the weight. The Constellation still has some heft though - at 179g it's heavier than both the Samsung Galaxy S4 and the HTC One. It's a trade-off we don't really have a problem with though, because the Constellation feels practically indestructible but, as you would expect, looks gorgeous. 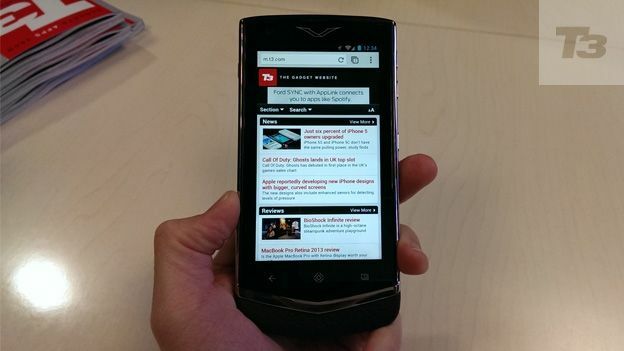 Vertu has skinned the Android 4.2 interface with its own UI. There's not a great deal of difference - but something worth mentioning is the analogue clock that greets you when you unlock the phone. Vertu has built the calendar into the clock in the form of blue notice bars around the edge of the face that moves as your reminder gets closer. The real features of the Constellation are the set of services that come as part of the phone package. Vertu Certainty is the name given to the phone's security features. All emails, texts and voice calls are encrypted by a partner company called Silent Circle, while a year-long Kaspersky subscription keeps malware and viruses at bay. Going even further though, the Certainty feature offers personal protection thanks to another partnership with a private security company called Protector Services Group. The GPS inside the Constellation means you can have yourself tracked and at any point hit the alarm button within the software to let the company know you're in a spot of bother. The response can be anything from a quick reassuring call to the spouse right through to scrambling pistol-packing bodyguards. There's also the Vertu Life feature, which will give you a rundown of exclusive events happening in your location. Owning the Constellation essentially gets you on the guestlist for these events, as well as offering you access to a number of private member's clubs around the world. Tucked inside the Constellation's impeccable tailoring is a 13MP, dual LED flash, rear-facing camera. You're given the usual Android settings to play with, including ISO levels, saturation and colour effect. The usual scene mode options are also there, including landscape, sunset, night and auto. Images themselves are a little on the dark side, but the colour contrast is good. The Constellation picks up a lot of detail, but we found that the autofocus took some time to settle. The camera here is on a par with the other leading smartphones, but doesn't offer anything that surpasses them. The Nokia Lumia 1020, for example, is a better bet if you're looking for a camera-focused smartphone. There is a front-facing 1.3MP snapper for making video calls as well and the Vertu Constellation will also shoot Full HD video. It also includes the sweep panorama function and you can also take advantage of the hundreds of camera-focused apps available on Google Play. Rather than go the quad-core route, Vertu has instilled the Constellation with a dual-core Snapdragon S4 CPU and 1GB RAM. On paper, these specs put it at a disadvantage - especially given that it's running on an older version of Android than the new KitKat incarnation. In practice though, the performance is definitely adequate. You'll be able to swiftly navigate through the menu as well as jump in and out of apps quickly. However, the Constellation will likely begin to struggle over time as you add more applications and install even more updates. We ran the Antutu benchmark app on the Constellation which returned a score of 21117, putting it above the Sony Xperia Z, but below the likes of the HTC One, Samsung Galaxy S4 or Samsung Galaxy Note 3. Of course, it's not just about raw power. By including less power-hungry specs, the Constellation makes the most of its 1,800mAh battery. We got a solid 24 hours of middling use from the handset that included making calls, playing games, browsing and sending SMS messages with the screen on full brightness. We're confident you could get a day and a half from the Constellation with careful use. Even at half the price of Vertu's previous handset, the Vertu Ti, the Constellation isn't a serious contender for the smartphone top title. It's a decent phone - but it's a fashion accessory, the same as a luxury car or a luxury watch. You'll admire it every time you take it out of your pocket. And the leather backing and sapphire screen undoubtedly make it the most tactilely pleasing handset we've ever gotten our paws on. In conclusion, if you've got the kind of cash to be considering a Vertu Constellation, then you don't need to be reading a review of it in the first place.